Tired from her run, sources say she regally collapsed on a very comfortable sofa. After being revived with smelling salts and small tasty tea cakes topped with mint and raspberry, she told her secretary to inform parliament and the populace that McCartney’s award be rescinded immediately. Released in 1979, the song was an instant hit with many who were hard of hearing. Recently released documents from Wikileaks revealed MI5 used the song to ‘persuade’ cold war enemy agents during interrogations. In 1992, the Geneva Convention outlawed playing “Wonderful Christmas Time” in a prisoner’s cell. Many British citizens believe an urban legend suggesting the song was written and produced by a demon named Hugh. 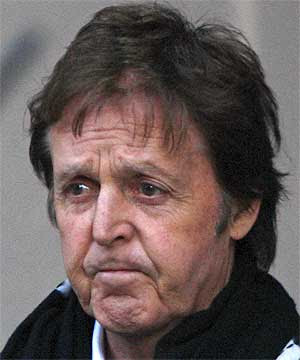 Other citizens feel McCartney was on an LSD trip and could not be held responsible for the song. Still others believe the song is a sign of the end times as was foretold by the hamster Gerald. Jason Bounce, curator of the Museum of Sir Paul McCartney, expressed his disappointment with the decision, but he said he understood the rationale. Spokesperson Upsnoot would neither confirm nor deny any of the rumors.